How come that a German based start-up from Germany is invited to Russia to work with Tretyakov Gallery, one of the greatest museums in the world and the national treasury of Russian fine art? The answer leads from the network of our investor next media accelerator to the Vienna and Moscow based RDI Digital, interdisciplinary business innovation collective, operating at the intersection of culture, arts and technology. More than thousend start-ups applied to their CultTech Lab Russia bringing together leading cultural institutions from Russia and Europe with some of the best international programmers, designers and startups to solve real-life challenges. 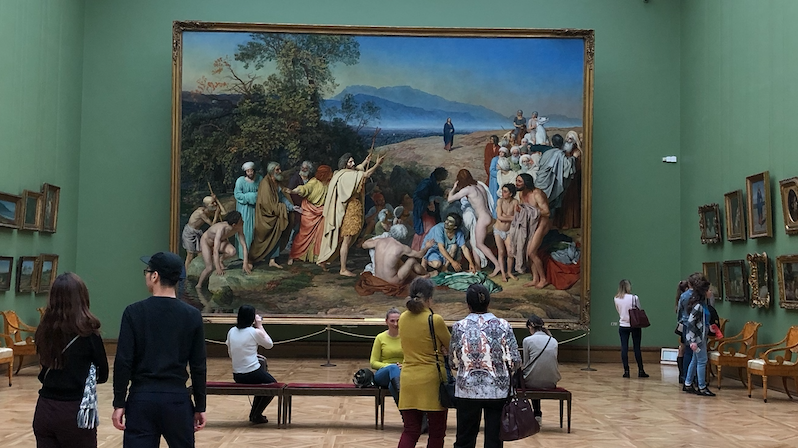 Helloguide qualified to prototype of a solution for Tretyakov Gallery to create impact through reach, entertainment and education about the Tretyakov assets – more than 130 000 works of painting, sculpture and graphics, created throughout the centuries by successive generations of Russian artists. The result of a 48-hours hackathon @ASI Conference Center in Moscow was an interactive chatbased museum guide. As the museums already has about 150 thousand followers on Facebook, it could be played out on Facebook Messenger to make access as easy as possible. At the St Petersberg International Cultural Forum, the international audience voted the helloguide solution for third best.